Welcome to another episode of the Couple Money Podcast where we talk about building up your marriage and your net worth. 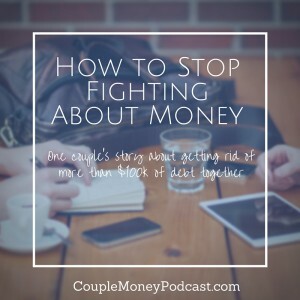 Today’s topic addresses one of the biggest obstacles to that – having disagreements about money. For the vast majority of couples, coming up with a budget, paying down debt, or saving for a goal takes time. Not just to follow through on a plan, but to come to an agreement. Focus for this episode is to find solutions to help couples communicate better and more honestly with each other. 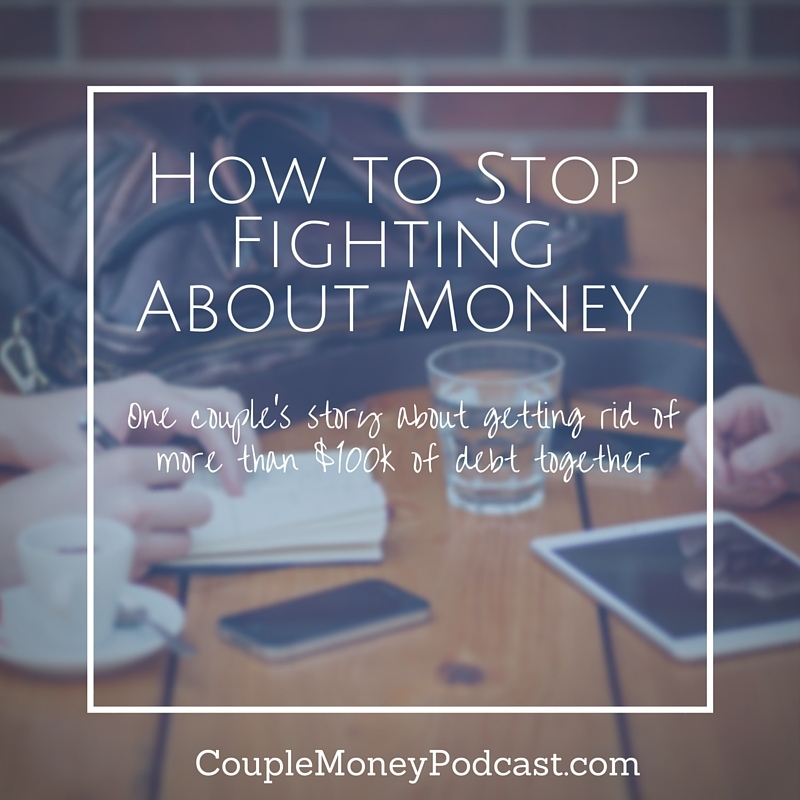 We’ll open up by discussing why do we argue about money and how we can diffuse the tension. Today we have Toni from Debt Free Divas share her family’s story about digging out of more than $100k out of debt. What makes her family’s story even more impressive is that when her husband and her began, they weren’t on the same page as how to reach that goal. Finally we’ll go over some tips to effectively compromise so both of you are happy with whatever plan you come up with. Like I mentioned on the show, I believe that having examples from other couples can be a huge help with having more productive money talks. One of my favorite podcasts on that topic is Derek and Carrie’s Better Conversations on Money and Marriage. They’re a fun couple to listen to as they discuss real issues they’ve faced as a team. How do the two of you talk about money without it becoming a fight? What money crisis did you face together and how have you grown from it? Do you have any podcasts, blogs, or resource you mention and share that does a great job tackling couples and money? One of the first issues couple typically deal with is whether or not to combine their bank accounts. Besides the financial reasons, there are also emotional factors to consider when making this huge transition. For this week’s show my focus is on showing how the two of you can have joint accounts and how you can build a budget together. 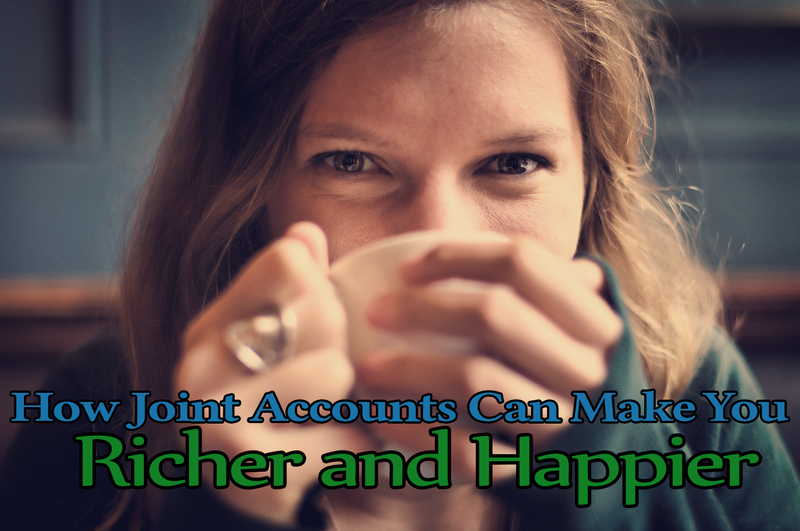 I open up the show with the advantages of joint banking accounts. If your current bank or credit union isn’t working for you, here are some suggestions on others you should check out. Finding the right checking and saving account can make all the difference with your financial system. Back by special request, my husband Rob returns to the show. You remember a couple of weeks ago, we interviewed each other about our first money chat? So fun to talk about the awkwardness of it (at least on my side). Naturally the conversation then turned to how we started our first budget, but because that wasn’t the topic of the show I edited some of it out. But now it’s coming back – you’ll get to hear how we came up with our initial budget system and what we learned from it. Want to start budgeting together efficiently and effectively? If you enjoyed the podcast, could you please share this with your friend or leave a rating and review? Have any questions about this episode or ideas for future ones? Please let me know in the comments. Learn how you can reduce college expenses for your kid while still teaching them self-sufficiency. This past week Julie gave her story and tactics on how her family managed to help her oldest graduate with no student loans. It was something they wanted to do for their daughter and I know many parents feel like them, but worry that it’s out of their reach. 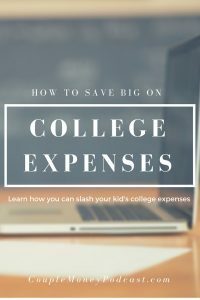 Over at Dave Ramsey, there’s a fantastic post 5 Ways Parents Like You Cash-Flow College (Without Sacrificing Retirement), giving examples of how families were able to budget and help with their kids’ college bills while working on their other financial goals. I wanted to highlight a couple of ideas that may help your family this semester and beyond. Angela and her husband were paying down debt, so they didn’t have the means to contribute directly for son’s college. What they could do, however, was provide free and board. Combining that with his scholarship and work money has made a huge difference with college expenses. Julie talk about how blogging gave her an additional source of income that help with Lindsey’s tuition. Is there something you or your child can do on the side that can earn you some cash? Besides helping out with college tuition, this can be a great way for one or more of you become an entrepreneur. Help your kid choose their school wisely. Dig around to find a high quality school that doesn’t cost a ton of money. It’s more effort up front, but the value is well worth it. Try not to get overwhelmed by the total costs. Break it down into more manageable steps. Look at the upcoming semester and budget that money into savings. Include your college kid in the plans and have them come up with ideas to save and earn money. Don’t feel discouraged if you can’t give like you want to. After all, paying for your child’s college is completely optional and a decision for the two of you to make together. The important thing you have to remember is that you do the best you can with what you have. So don’t compare yourself to another couple because no family has the exact same situation and circumstances. If you enjoyed the podcast, could you please share this with your friend or leave a rating and review? My goal to make this podcast both motivating and practical for couples looking to building their marriage and finances. If you have any questions about this episode or ideas for future ones, please leave a comment. 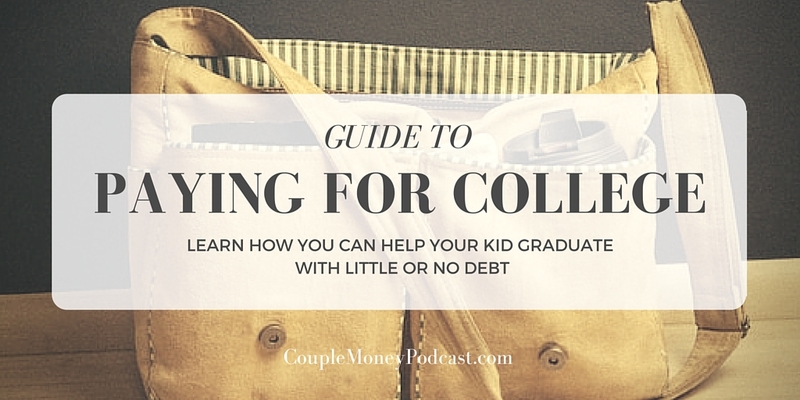 Want to help your child graduate college with little or no debt? Learn how you can pay for your kid’s college expenses without ruining your finances. Paying for your child’s college education is a personal matter that many couples struggle with. If the two of you are thinking about opening up a college fund, today’s episode is for you. 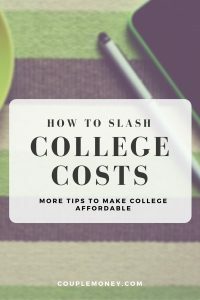 We’ll start off with some costs to consider so you have a better idea of how much to save in the college fund, how a 529 can help you, and finding the right one for your family. Julie from The Family CEO has personal experience as her family pulled together and paid for their daughter’s college education so Lindsey could graduate debt free. What’s more impressive is that did this will only limited savings in the 529. I interview Julie to see exactly how they did this. 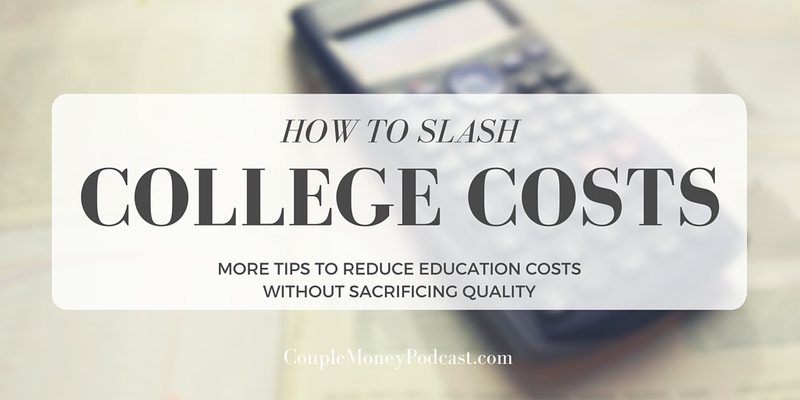 I wrap things up today with ways you can reduce college expenses without sacrificing quality education. According to College Board, the average total costs for undergraduates can range from $18,391/year with an instate student at a public university to $40,917/year for private nonprofit university. For many families that’s a lot of money. The best way for them to get that ready is use a 529 to grow their savings. 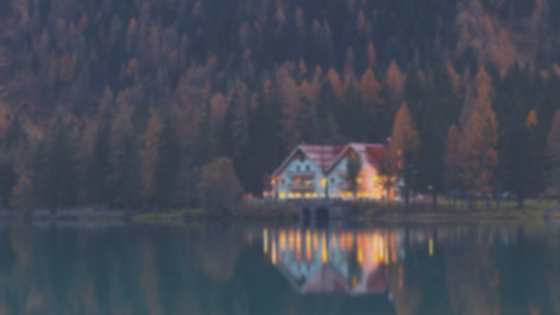 A 529 plan, also known as a Qualified Tuition Program (QTP) is a tax-advantaged savings plan. Contributions to 529 plans are not federally tax deductible, but qualified distributions are tax free. You may get additional benefits if you invests with your state’s plan. Some offer deductions for your contributions which can be very handy for your family. Don’t be confused, your child isn’t require to attend a college in the state. 529 Plans can be used to pay costs of qualified expenses throughout the country. So if you’ve invested in North Carolina’’s 529 plan, you can still use that to pay for your child’s expenses in California or Texas. Another advantage of using a 529 for college savings is control. Even though your child is the beneficiary, you manage the account. To sign up for 529 for your child, you can go directly through a 529 plan manager (such as your state’s program) or you can use a financial adviser. Just because the two of you decided to foot the bills doesn’t mean that your child can’t pull their weight and keep expenses reasonable. As Julie mentioned, Lindsey paid a huge role withe her education by applying for scholarships and keeping her grades up to maintain them. I have some ways on how you can work together and reduce college expenses. Not all of these ideas will work or appeal to you, but these have been incredibly helpful for other families. I’m going to start off with community colleges for the first two years and transferring to a university for the last two. Besides offering freshman/sophomore level courses at a fraction of the price of many local universities, many cc have classes schedules that are more accommodating. Staying in-state can dramatically cut your tuition expenses. Here in North Carolina, Chapel Hill lists NC students tuition and fees for this year at $8,374 compared to $33,624 for their out of state classmates. Make the most out of high school and see if your child can take Advanced Placement or AP classes for some of their subjects. If they receive high enough scores on the exam, colleges can grant them credits, saving you significant time and money. It also has the added benefit of making them more attractive students for admission as they’ve proven they can handle the college level material. Your child might also want to go ahead and take CLEP exams to get out of some introductory college courses. It’s a great way to save and it allows them to take a more in-depth course should they choose. Besides need based, there are tons of merit based scholarships your child can apply for. The key to getting the most bang for your buck is to have a specific system in place. Ramit Sethi, a Stanford graduate and successful entrepreneur, gave advice on how he received $100,000 in scholarships. Every dollar counts so encourage your child to do as much as they can with reducing college expenses. If you enjoy the podcast, could you please take a minute share it with your friends or leave a review and rating? Every bit counts and I would love to have your support.